Arrive a Day Early or Stay a Day Late? Spirit Canoe: A paddling ritual for getting us there and bringing us home. This sculpture strongly caught our attention when visiting the Museum of Fine Arts in Boston some years ago. It can be seen on line in the thumbnail photos of the museum’s collection. 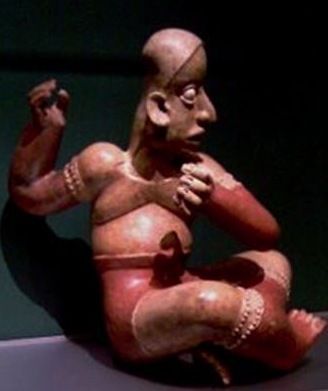 The museum calls it “Seated Male Figure, Mexico, Jalisco, Ameca –Erzatian Style, 300 BC – AD 200.” From the museum: “Frozen in mid-action, this figure’s twisted torso accentuates the implied motion. Other figures from Jalisco take this position as well, suggesting that it was a ritualized pose with some symbolic significance.” While parallel in time to the Aztecs, archeologists find there is a diverse set of styles in Western Mexico during this time period. What initially caught our attentions at the museum was the expression on the face of this piece. The figure is looking slightly away, his eyes stretched wide open, his mouth also open, as if in an expression of surprise. When we assumed the facial expression, our intuition was that this figure was experiencing surprise and wonder, a sense of “Mysterium, Tremendium, et Facinans” Rudolf Otto. Since we in the Svaha Spirit Lodge often use posture journeys to craft our spirit work, we experimented with this and another sculpture at the BMFA, an Inuit hunting piece. When we assumed the Inuit stance in a journey, we found it to be straight forward and it didn’t offer anything to us. However the other posture was strange. When we assumed it to journey, it simply said “Not Now” and even “Stay Away”, which we honored. During these exploratory journeys we were journeying individually – not touching or attempting to meet in the spirit world. Then a year later at the Winter Solstice our Svaha Spirit Lodge was in the midst of using a group Shaman’s Canoe journey when about 30 of us spontaneously entered this posture. Some of us had never even been exposed to it, or had seen it. Yet, here we were all doing it as one. The journey’s cadence and paddling picked up markedly. We were moving faster, deeper, and with more power than any of us had ever experienced in a group journey. As we went we were gathering up spirits, ancestors, and totems, all coming into the canoe to join in the work (or to be worked on). When a group paddles a canoe together, they become something greater than the parts. And that is part of the medicine of this posture – to gather, to protect, and to propel us along in the journey: to get us there and home again. The medicine also seemed to be a cleansing, as in sweeping unwanted things past us, on by the canoe, and back into a fire which was located behind the canoe (in this world). The rest of the medicine was the experience of wonder, surprise, and joy at where we were going (being taken). We all came back with a sense of having been cleaned and invigorated in some deep way. And, in particular, the Ancestors were very pleased about our relearning something that had long been forgotten. After our Solstice experience we saw that this posture was clearly a paddling one. It felt like paddling a canoe: one hand was high and cupped as one would if holding the top of a paddle, the other hand in a power grip oriented in a line from the top hand suggesting a dowel or paddle. In our later research we surmised that paddling a canoe was highly likely in the provenance of this sculpture. This geographical area hosts Mexico’s second largest river: the Lerma – Santiago river, Mexico’s largest lake: Lake Chapale, and many lagoons along the Pacific coast. Show us what we need to know. Please use our Contact Page to send a note requesting online registration. This helps us keep our online membership safe and selective. Neurotheology: Connection of Neuroscience & Spirituality. Finns and the Saami— Rich Shamanic traditions.